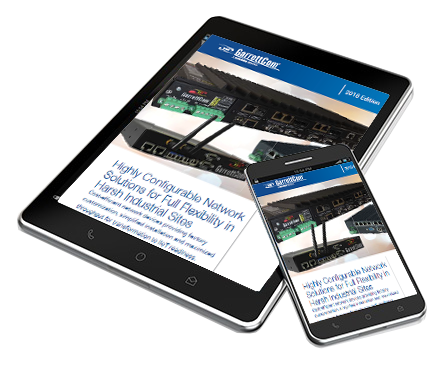 Combine a Gigabit (Gb) Fiber Media Converter and a two-port 10/100/1000 copper Switch, and you have the Magnum CSG14 Converter Switch, a new high-speed flexible edge-of-the-network industrial Ethernet product.Add in Gb fiber port choices for all multi-mode and single-mode Gb fiber connector types plus DC or AC input power selection, and the metal case and configuration choices you expect from Magnum products, and you have the answer to many Gigabit connectivity applications in industrial networks. 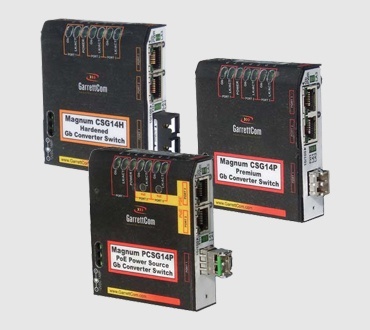 The Magnum CSG14 family of Gb Converter Switches with a Gb Fiber port built-in covers the full range of Gb fiber port choices. Models available provide a) fixed Gb fiber ports for short distance SX fiber, b) fixed Gb fiber ports for 2km multi-mode, c) fixed LC-type transceivers for robust single-mode Gb fiber, and d) SFP ports (Small Form-factor Pluggable) for flexible choices of the transceiver distance needed. Offers extra RJ-45 Port - Provides one Gb fiber port and two (2) 10/100/1000 copper switch ports. Port Flexibility - Two RJ-45 ports are triple-speed auto-negotiating to enable attaching any 10 Mb or 100 Mb or 1000 Mb (Gb) device; Both multi-mode and single mode Gb Fiber ports available. Two Models for Heavy-duty Application Environments - Hardened for Factory Floor; Premium-rated for -40°C to +85°C, and outdoors. Power Flexibility - Integral terminal blocks for 12, 24, 48VDC power input, external AC power supply optional. Either DIN-Rail or Tray-Mountable - Same packaging and mounting options as other Magnum Products including CS14, CSG14U, CSN14, S14, and PS14. Two Models for Heavy-duty Application Environments - Hardened for Factory Floor; Premium-rated for -40 to 85ÂºC, and outdoors.